Our DONJOY Performance Trizone Elbow Sleeve is a hybrid design combining the properties of compression and bracing in a single sleeve. The carbonized bamboo circular knit construction allows for targeted, zonal compression. Three distinct compression zones which include: a stability zone with strategically placed injected silicone to provide support for the elbow joint and the benefit of enhanced proprioception, a compression zone which improves circulation and provides mild support to the joint structure and surrounding muscle tissue, and a comfort zone that provides lighter compression for enhanced fit. The Trizone elbow support is a low profile performance product designed to keep you moving and supported. Most of the positive reviews are from men. Will this fit a non-gym rat female? Looking for support and shock absorption for tennis in medium to high recreational/club level. The DonJoy Performance Trizone Elbow Support is a great brace for women and men. It will offer a stability zone with strategically placed injected silicone to provide support for the elbow. Yes, it will provide compression on to the arm and supporting the bicep and triceps muscles. Which will help reduce soreness. My son got his elbow hit in a football game from a face mask. It swelled up some but didn't hurt. He played his next game and after that game his elbow was huge and hurt. I am sure it is the bursa sack causing the problem. Will this protect it and provide cusion from the impact on his elbow when he plays his next game? The Trizone Elbow Support is great for compression and should help aid in supporting the joint for lifting. 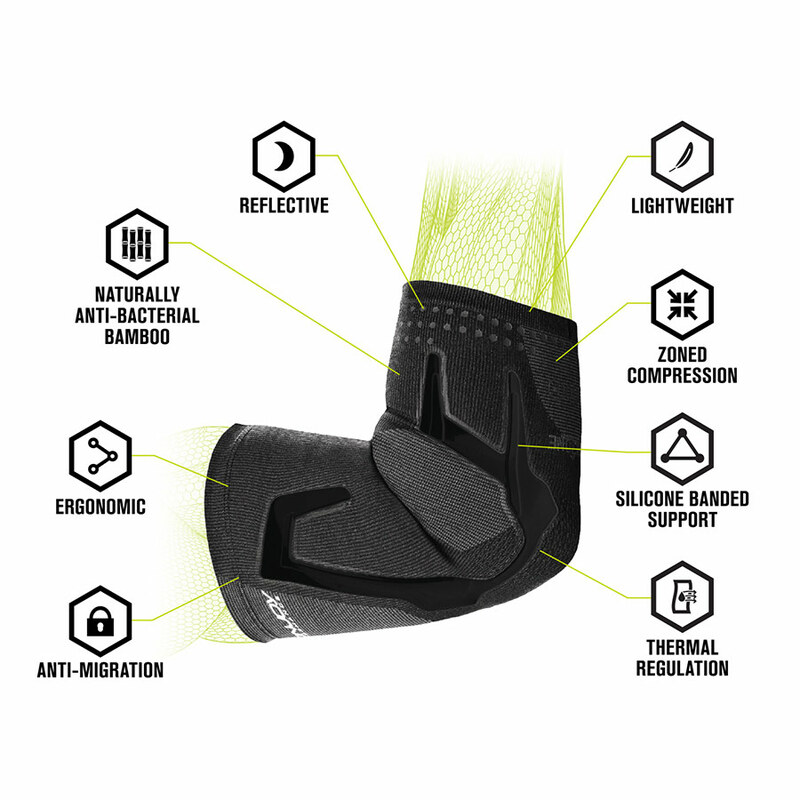 If this does not provide enough support the DonJoy Performance Bionic Elbow would be a step up in support, and protection. My 12 year old daughter does competitive cheer. She often complains of her elbows hurting and they often give out on her while tumbling (especially during back handspring ). We have tried several braces and are having a hard time finding one that gives her support while letting her still bend her elbows for tucks and basing. Which elbow brace do you recommend? Yes, the DonJoy Performance Trizone Elbow Support would offer her compression for enhanced fit and better range of motion. It is designed to keep you moving through repetitive motion injuries. My daughter, who is 12, dislocated her left elbow playing softball. Would the bionic elbow brace or trizone elbow support be better for playing softball, she is a pitcher. Which one would have better range of motion to catch a ball hit back to her at the pitchers mound? Our DJP Bionic elbow will be her best choice, this will not restrict any motion in her arm, and will provide the maximum stability to her arm. The x strapping will help prevent hyper extension. I measure at a 9, 9 1/2 so what size should I get or is there a way to make it smaller.. The smallest size available is a Small. The small starts at 10 inches. You could try it and see if it will work out for you or not. You have 60 days to return the item if it doesn't work out for you. I have a severe form of bursitis on both elbows from leaning on my elbows for a long periods of time. My elbow circumference is 11"
I have tried other braces and they do not work for me as the material makes my skin itch, the brace binds on the elbow joint and they slip off (Even when I measure per the manufacture instructions) Will this brace slip or bind and can I use this brace for sensitive skin? Can I use all day too? What do you suggest? I'm desperate for relive and protection of my elbows while they heal. Many Thanks. The DonJoy Performance Trizone Elbow Support would be a good choice. It is great for sore elbows and overused elbows. It has three zones of compression delivered to the elbow. It is made from carbonized bamboo which is great for temperature control and it is also anti- bacterial to help eliminate odors. You would need to measure the circumference of your mid- bicep in the relaxed position to determine the correct size for you. I've had this brace for just over a month and some of the silicone is cracked at the elbow joint (right through). What is the warranty on the brace? I recently had surgery for a complete tricep tendon rupture and also a partial tear of the medial tendon...will this brace help me with support and comfort? My 14 year old daughter is a softball player. She plays infield and pitcher. She tore the ligament in her elbow. It is healing but does bother her throwing overhand. She uses the hinged donjoy for basketball but finds it to restrictive to pitch with. Would this be a good option? I am right at 13 inch, should I get the M or L? I see the brace references the tennis elbow (lateral epicondylitis). I have medial (golfers elbow). Is this brace just as effective? I have a hyper extended elbow the doc sugested a brace. Will this be sufficient support on my elbow for bowling. my arm is larger than whats on your sizing chart .Do you makeextended sizes? I have had tennis elbow for months and it's starting to get better but I still can't do certain exercises or lift heavier weights. I just started using lighter weights again, will this help? Every time i do bicep curls i feel a sharp pain in my elbow and cant go below 90° without discomfort. Will this one be the best fit for lifting weights, and whats the guarantee on the return policy if it doesnt help? Can this brace be used on the left arm? I play quarterback during flag football and I have a partially torn UCL. Would this help stabilize my elbow while I'm playing? 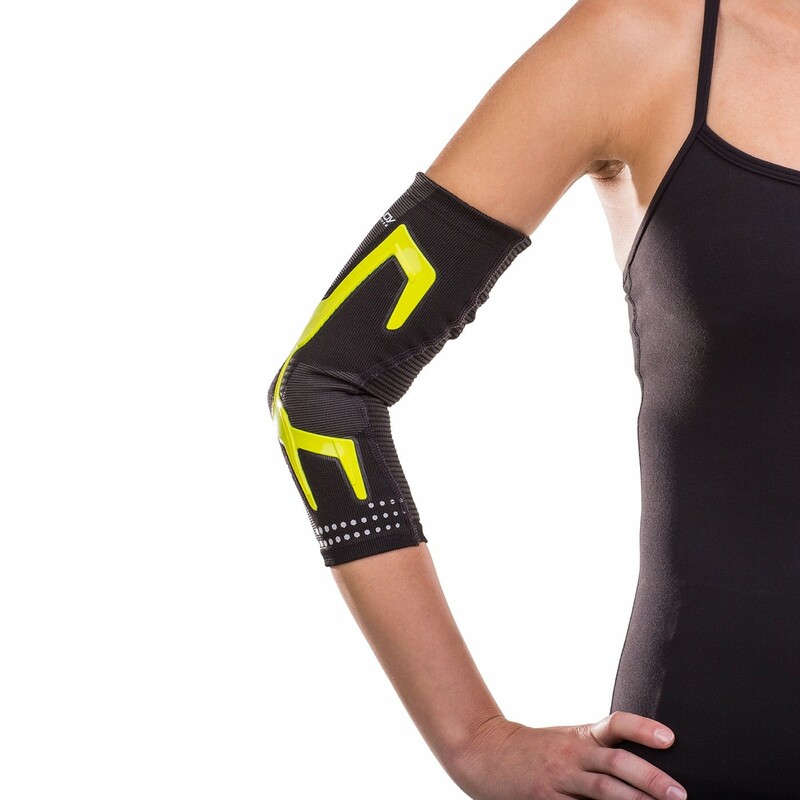 The Trizone Elbow Support will provide compression and warmth to your elbow while it is healing. If you would like a little more support the Bionic Elbow will provide bilateral support with the hinges. For sizing. It says to measure the middle of the bicep. Do u measure the bicep flexed or unflexed? As I would imagine this would affect how it fits when working out. Can I use this brace when I lift weights? If not what brace do you recommend? Hello, I've been reading on all of your TriZone products. Whats the difference between circular knit and 4 way stretch? Are they similar? I go to the gym every day. When I do BENCH presses, my elbow hurts right where the tendon meets the elbow. ( tendonitis) Does your product help support the tendons while doing bench presses? The Trizone Elbow provides compression of the elbow and mild support over the silicone areas of the brace. The Trizone Tennis/Golf Support would focus just on that area of your elbow which is bothering you. Hi I dislocated my elbow last year wrestling. And I am coming back this year to start competing again. Will this brace help keep my elbow stabled and help prevent injuries. Is there a better brace ? I have a small tear in the tricep and am looking for something to wear for support while I'm rehabbing it at the gym. Would this be the best option? Yes the Trizone Elbow support will provide compression and support to your elbow while working out. Would this brace be ok for heavy lifting bench press? Is this brace appropriate for a water polo goalie who has a hyper-extension injury? Basically, can this brace be in the pool and get wet? The Trizone Elbow Support can be worn in the water and while playing water polo but it will not prevent elbow hyper-extension. The only elbow brace that will prevent hyper-extension is the Elbow Guard or the Bionic Elbow. Can I wear this brace during softball and basketball on my throwing and shooting arm? To correctly measure this, is it measured with a flexed bicep or static? Does the orange go on the outside or inside of your arm? The orange silicone banding is designed to target medial and lateral elbow pain. The Orange banding will sit on the inside and outside of your elbow. Please contact us with additional questions at 1-800-553-6019.
i would like to ask if i can use this in water for surfing. if not can you sagest me a waterproof elbow supprt? Yes, you can use the DonJoy Performance Trizone Elbow Support in the water. Just make sure you rinse with fresh clean water afterwards, and let it air dry. It gave my athlete (QB) the support he needed after his elbow injury. He was very happy with it. Great product. My elbow feels much better. Been using it for a couple months. Elbow feels much better.